It's going to be a fun weekend. A whole lot of Texas music, chili and beer will be enjoyed by all. All weekend long Clean Cab Company will be making runs from Bryan & College Station to Chilifest in Snook Tx. Many other local cab companies ﻿will﻿ also be making the trip back and forth on a constant basis. So don't worry, there should be enough public transportation to get you there and back if the need arises. Don't fret if you realize during the trip you forgot something. There are stores along the way. We want you to have a fun time without being inconvenienced. 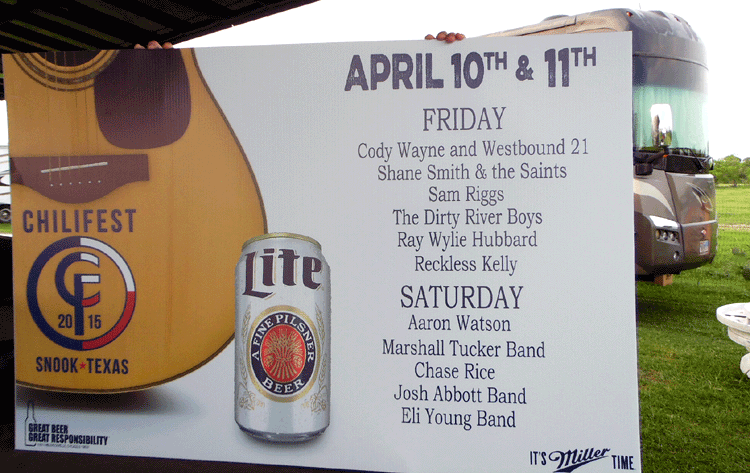 Visit the Chilifest music line-up page for 100% accuracy on the time each artist plays. This is just a list of the musicians and might not be in the correct order. I was just reading an article in the local newspaper website about chili fest in Snook. I read last year law enforcement made 150 stops. 15 were arrested for DWI (same as DUI). The article also stated a 100 police officers will be inside the festival gates, and 50 more outside. A judge will also be on site to process those who cause trouble.